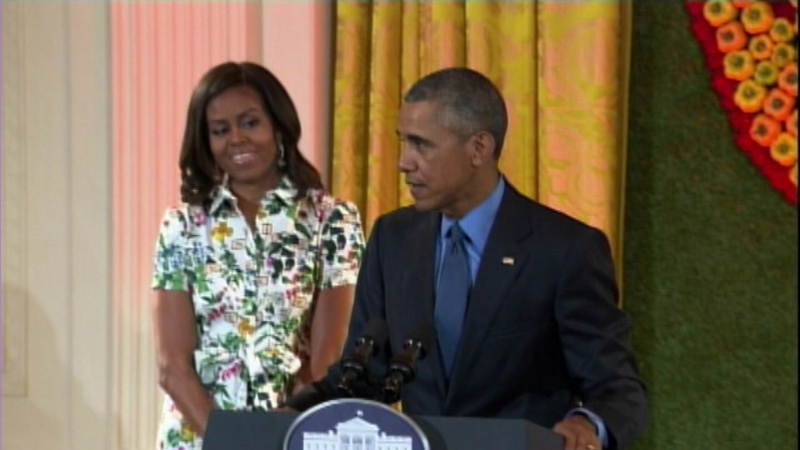 First Lady Michelle Obama was joined by President Obama when she hosted a room full of child chefs Friday. WASHINGTON (WLS) -- First Lady Michelle Obama hosted a room full of chefs Friday, but these aren't your ordinary chefs, they're not even over the age of 12. Young culinary artists joined the first lady for lunch after winning the annual healthy lunchtime challenge. President Barack Obama even dropped by to surprise them. Among the kids present was 9-year-old Shreya Patel of Schaumburg. The menu featured several of the winning lunchtime recipes, including the winner from California: a taco served with Mic-Kale Obama Slaw and Barack-amole (rhymes with guacamole). Mrs. Obama said the students "blew the judges away" with their talent and creativity by using all types and colors of fruits and vegetables in their recipes, even incorporating flax seed, cumin and yellow miso paste. She said she hopes the kids will "pay it forward" by becoming healthy-eating activists back home. "A lot of kids don't understand that food is fuel in a very fundamental way," the first lady said, standing in front of an arrangement of yellow bell peppers shaped into a hand with a thumb and fingers. "And sometimes they don't listen to grown-ups, and they don't listen to the first lady. But many of them will listen to you because you're living proof of that reality." "So I want you to kind of think about how you can move this issue forward in your communities," Mrs. Obama said. "What more can you do when you get back home to continue this conversation and to engage more young people in the work that you all do? That's the only thing that I ask of you." President Obama reinforced the message during a surprise appearance. "You guys are setting a great example for all your friends in school and in the neighborhoods, and we're really proud of you for that," he said. The students were also treated to a performance by the cast of Disney's Tony Award-winning hit musical "Aladdin," and a tour of the first lady's vegetable garden on the South Lawn.